Why is it so important to make sure your website home page has these basic elements? “You never get a second chance to make a first impression”. 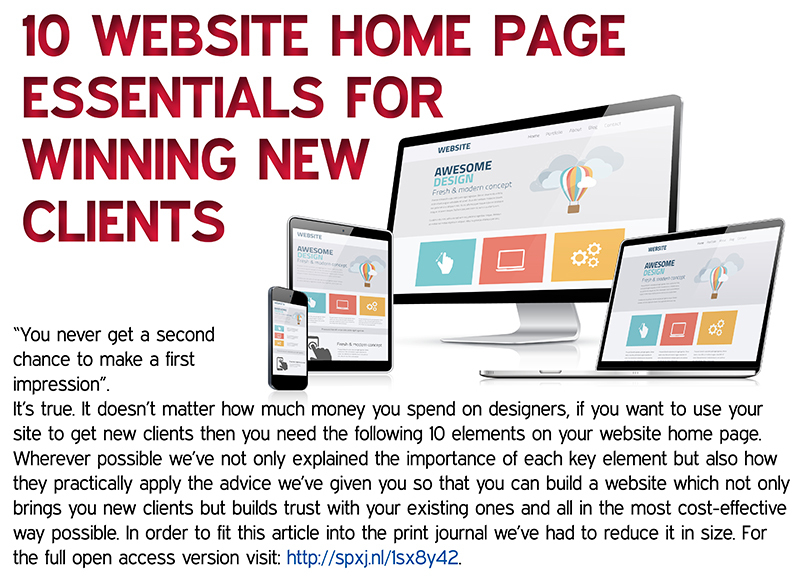 It doesn’t matter how much money you’ve spent making sure the design of your physical therapy website is top notch, or whether you are super-search engine optimised, if you want to use your site to get new clients then you need the following 10 elements on your website home page. Wherever possible we’ve not only explained the importance of each key element but also how they practically translate to helping you get new clients and build customer loyalty. At each stage we’ve included DIY resources so you can do as much as possible yourself, and with the least amount of cost. And finally...How to find out if your website is mobile friendly. We’re big fans of the Hubspot marketing blog. 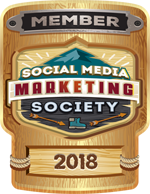 It features some of the best, most useful resources covering a whole range of marketing topics. Sadly I can’t afford to sign up to their platform as much as I’d love to, but it’s not going to stop me ranting and raving about their awesome resources! The infographic on at this link served as the foundation of this article which we’ve then adapted specifically with the physical and manual therapist in mind. Wherever possible we've tried to include practical advice on how to bring to life each of the sections in the most cost-effective and practical way possible and included links to useful related resources, such as this one (again from Hubspot), which is a free workbook download: “The ultimate guide to redesigning your website”. How do I choose a name for my therapy business? I’m a Small Business - why do I need a brand? OK I have a name for my business, now how do I create a logo? Remember this advice also applies to people who have an existing logo and want to spring-clean it, as much as it does to someone creating a new logo. Fiverr describes itself as the marketplace for creative and professional services. It’s basically a way to link up with a whole range of designers who can very cost-effectively help in the creation of all sorts of artwork including branding and logo development. Designs basically start from £5 (hence the name). It’s a great resource for small businesses and the self employed (Tweet This). If you have a bit of design flare and fancy creating your own logo or you already have a logo and want to modernise it, but lack the software to do so, try sites like Canva or Relay. There’s a really useful podcast and written transcription that you can read at this link on “How to easily create visuals without a designer”. We found a great blog post at WebsitesInWP which outlines a fun 2 step process to help you sum up your business in one sentence (Tweet This). There’s also a good post here on how to describe your business in two sentences. Make sure your headline/business statement is right up there on your website, near your logo so that it’s the first thing you see. After you’ve got your logo and your brand statement the next thing to ensure you have on your home is one or more calls to action. So your potential client is on your home page, now what? You need a call to action or CTA. To take things further you want them to interact with your website. A commonly used phrase in modern marketing is the “Know, Like, Trust, Convert” factor. First someone has to get to know you, whether that’s through your website, or your social media profiles. The second step is that you then want them to learn to like you by giving them useful information or resources that help them. The third step is for them to transfer that like to trust, at which point the chances are that you’ve got yourself a new customer and you hit the conversion point. We already know as therapists that trust is a particularly important part of what we do, so you need to move through this process responsibly, carefully and considerately ie. no spamming or hard selling. That’s a bit like walking up to someone you don’t know, saying hi, and then asking them out for dinner. It might work for the quirky types who like that style but the majority are likely to run! So don’t do it online. This is how Wikipedia defines a Call to Action (CTA) in marketing terms. Your call to action needs to be persuasive but resist the temptation to go for the hard sell. Remember your website visitor doesn’t really know you yet and certainly hasn’t moved to the stage of ‘like’, so it’s way too early to get them to trust you just yet. Hubspot has some good advice about the physical appearance of the call to action button but be realistic about what your potential client is looking for at this point and therefore what action they are likely to take (Tweet This). 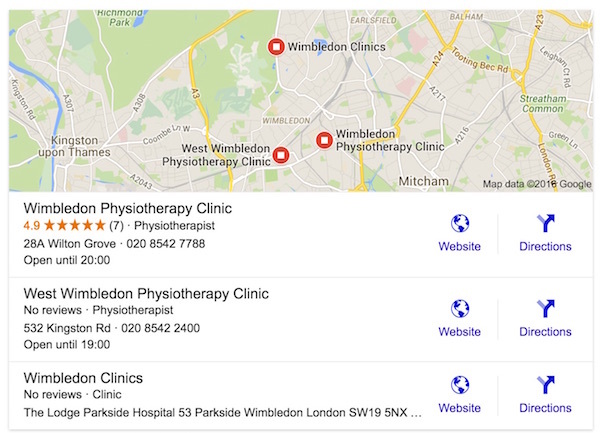 Your visitor may be an existing client who’s just jumped on your site to get your phone number, address or find a map of how to get to your clinic for their next appointment (so make sure these are easy to find from the home page). The visitor you’re wanting to catch the attention of through your call to action is the new customer who may have found you through a recommendation or through your online or offline marketing efforts (although there’s definitely no harm in offering your existing clients added value if they spot a CTA they like while visiting your site, it all contributes to building the relationship). The holy grail of the call to action at this point is to get your potential client to give you an email address (but please don’t immediately start spamming them with a load of sales emails). Try and get into their heads and figure out what it is that they really want information about or help with. If you can't come up with anything then try asking your current clients. Then set about creating or sourcing something that will ‘serve’ them. We’ve given you some ideas below as a starting point, feel free to invent and experiment but whatever you do you must make sure you’re measuring it (see below for details)! Do your patients frequently ask you one or more similar questions? If so, why not put a short Word document together to answer that question (ideally featuring your logo to reinforce your brand if you can do it easily). Then you can offer a link or a download to this document in exchange for their email address (more details on how to do this below). Alternatively you could utilise our client advice leaflets and offer this as a download. You could change the leaflet you are offering depending on the season you’re in - around the Wimbledon Tennis Championships offer the tennis elbow leaflet as a free download, in the marathon training season offer the tendinopathy or blister treatment leaflet etc. Here’s a list of all our current client handouts. Or mix it up and offer different resources at different times to coincide with maybe trends in the news, major sporting events, times of the year. The only way to see if what you’re doing is working is to measure it. Google Analytics is a phenomenally powerful tool that’s free and gives you all the opportunities to track what you’re doing without costing a dime. If you haven’t got it set up on your website yet, then get it installed ASAP! It’s very simple and just requires copying and pasting a small piece of code into one or more web pages or your CSS template which then ensures it’s present automatically on every page using that style sheet. If you’ve used a web developer then you should already have it installed (if not then ask your web developer to do it and consider firing them for not doing it automatically!). If your site is hosted on one of the web-based platforms like Wordpress, Squarespace, Wix etc. then it should be pretty easy to install. Just Google for instructions (Tweet This). We’ve included more specific details on installing Google Analytics and setting up goals in our follow up article on how to implement some of the ideas found here (Tweet This)(Tweet This). 3.3 Want to use our client leaflets as downloads? Here’s how. If you’re already a full site subscriber you can access all the leaflets we have available, just download them and then store them wherever you need to in order to offer your document download. If you’re not a subscriber you’ll find two leaflets available free of charge as part of your registered account (use the Register button above). If you want more leaflets, you can either purchase each leaflet individually for around £1 per leaflet or take out a subscription to the client and patient resources section of the website. This is too big a section to describe in detail here but if you want to know how to set up document downloads on your website we have outlined a few options in our follow up article "Optimising your physical therapy website to generate new leads and get new clients". (Note: This is a subscription-only article which can be purchased individually or is included as part of a subscription to the Entrepreneur Therapist or within the Full site subscription). Make navigating your website as easy as possible with simple/clear headings and trying to limit this to 7 items or less. A search box is also a useful feature for visitors to find what they’re looking for. When your service is healthcare-based, establishing trust is key so make sure to include details in an About Us/Staff/Meet the Team/Our People section. Wherever possible include pictures and biogs and keep these up to date. It’s also a good idea to include links to your social media profiles but only if they are professionally orientated. This is a time for reputation building, not a diary of your personal life lived through Twitter! At the very least include LinkedIn if you have a LinkedIn profile (and if not, it’s worth setting one up!). The other thing that patients will frequently look for is location information so make sure a Contact Us page or Find Us page are…easy to find! It’s easy to include an embedded Google map and it makes a Find Us page look pretty, but make sure you also include the text for your full address on the page as well (Tweet This). A Google Map won’t easily display the actual address, just a pin on a map. Video is growing rapidly in popularity and live video is social media’s golden child of the moment as we write this article (July 2016) so if you (or someone else you work with) loves being in front of a camera then get your camera out and start filming! It doesn’t have to be of a super-professional quality but do some reading up on the basics of video filming to make sure you’ve got the simple stuff covered. Remember this is all about developing your reputation as a therapist and building trust. Why not answer your frequently asked questions by video, or talk about a topic in the news, or talk about a certain injury or condition. Interview staff members, maybe even ask current customers for a testimonial by video (this adds to your social proofing - discussed in more detail further down the article). Embed a Google Map on your website - instructions for inserting a Google Map. Are You Making These Common Website Navigation Mistakes? Most people are visual, so you want to make the home page look inviting with the use of a graphic/image and/or video, while making sure to use media that is relevant, illustrates what it is you offer and is also in keeping with your ‘brand’. If your budget or photography skills are less than adequate, we’ve found some useful media resources below (Tweet This). Want to get a bit more sophisticated with perhaps an explainer video or an infographic? Fiverr would be our choice here. I was listening to a podcast the other day on the best ways to get your business found on Google and the single one thing that stood out was making sure you had reviews on Google (those are the yellow stars you see under the company name in image below). In fact the guy being interviewed (link below) said if he only had time to do one thing of all the things he’d discussed in the podcast, it would be to make sure your Google Business page was set up and that you were collecting reviews (Tweet This). Here's how to add ratings and reviews on Google - give your customers the link to add a review as soon as you've set your page up (if you're nervous about asking, ask your favourite clients first and get a few good reviews in the bag). Gather client quotes or snippets from emails or letters - with no budget you can make a nice little graphic (known as an animated gif) which flicks through three or four quotes (much like the one we've produced below). 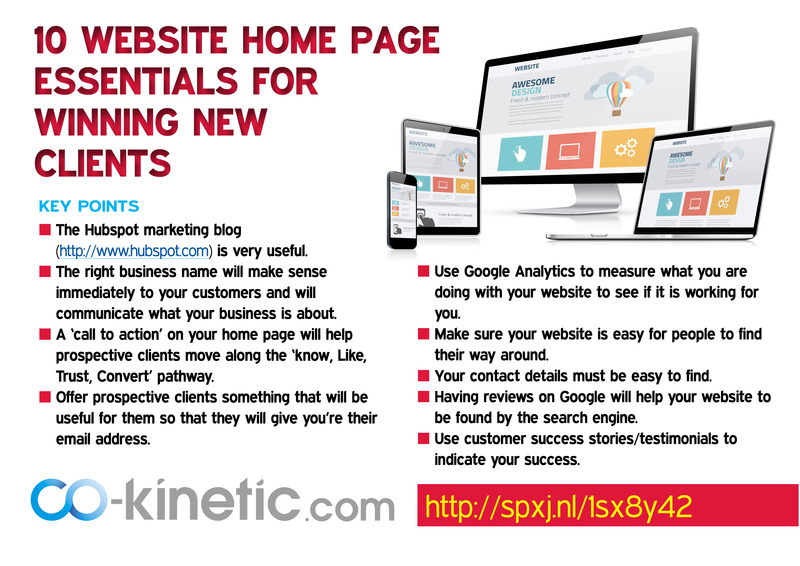 We’ve included step by step instructions on how to do this, in our follow up article "Optimising your physical therapy website to get new clients"). Be opportunistic about capturing these nuggets. While we were at our most recent conference, two subscribers gave us perfect 'nuggets' - one subscriber said "Your journal has saved my physio life on several occasions" and another described it as "the most energetic and exciting journal in our sector without doubt". I would never have thought to come up with quotes like that, they come across as being real and genuine because they are! Here’s the link to podcast Local SEO Tips for Small Business Owners. If you don't believe me about just how important reviews are becoming, simply click our link or Google "Why Google reviews are important" and you'll get lots of good answers that basically boil down to the same thing, it supercharges your SEO efforts. Here's an article we liked on Why Google Reviews Matter for Small Businesses. Over 75% of home pages have social media links, with Facebook and Twitter being the top platforms of choice (assuming of course you have professionally-orientated Facebook or Twitter pages - if not, don’t add them! Tweet This). New Data: Should You Include Social Media Icons on Your Homepage? Want us to create a short video on how to do this? Post your request in the discussion area below for what you want your Twitter feed to show. If you haven't got time to create the resources yourself (or need a helping hand) why not use our printable, downloadable patient information leaflets. You can purchase these individually, as part of a subscription to the patient section or they are included within a full site subscription (purchase details can be found here). We've also made two leaflets available if you register on our site (it's free!). Other suggestions for creating useful resources could be to create blog posts around questions you find yourself being asked on a regular basis, or discussions you regularly have with clients, or even hot topics in the news that fall into your area of expertise. But remember, this is about establishing trust and credibility, so stick to what you know or use trusted sources of information (Tweet This). 10. Success indicators: blowing your own trumpet (discreetly)! Do you work with any sports teams, organisations, groups or businesses with recognisable brands? If so, why not add a strip of logos on your home page. (Note: Want to know how to create a strip of logos? Ask us using the discussion forum below and we'll put some step by step instructions together for you using free tools). 11. 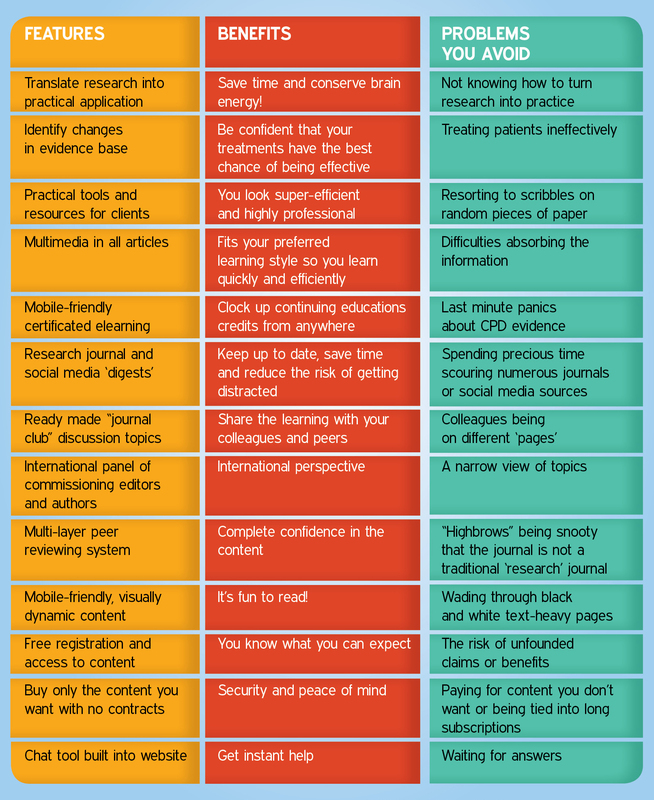 Is your therapy website mobile-friendly? OK I know I said 10 points, but I couldn't resist adding this one because it's becoming increasingly important for a couple of reasons. Firstly it's important for the customer experience but secondly (and arguably more importantly) it's becoming a key factor in Google's search algorithm which decides how to rank sites. If your site isn't mobile friendly, your chances of appearing high up in the Google ranking reduce considerably. It's so important that Google have even developed a tool to test it! Enter your website address at this link to see if your website is mobile friendly. 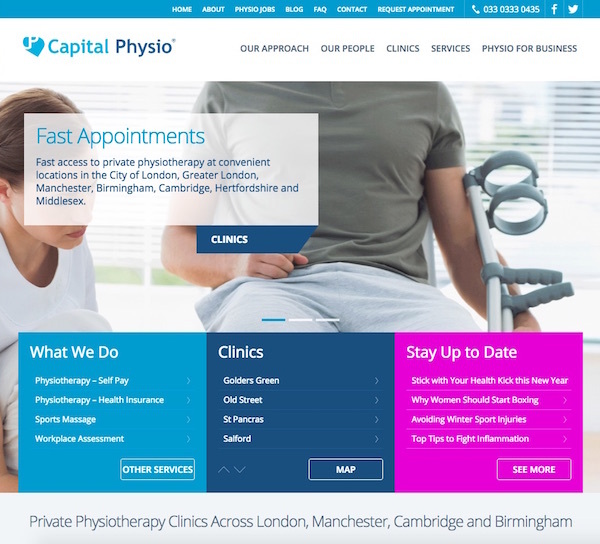 Capital Physio’s website. Admittedly this is a big clinic group with bigger budgets than most of us will have access to but that doesn't mean you can't glean some useful ideas from it. 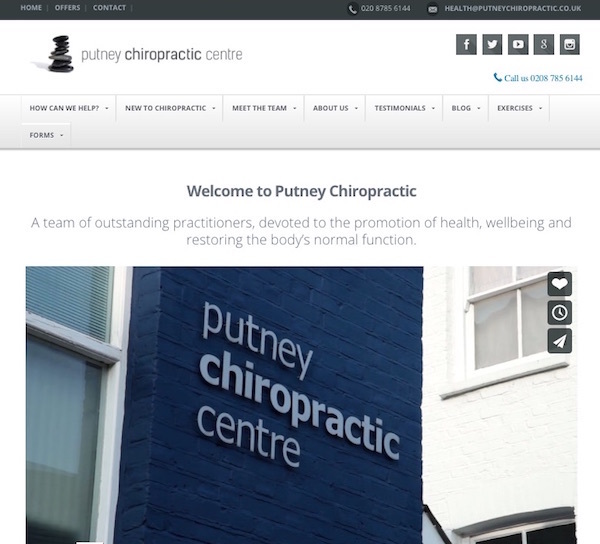 The Putney Chiropractic Centre does a fantastic job of portraying a very professional look while being very welcoming and unintimidating. They also make great use of video which as we will cover in a future article, as this is the rapidly-growing media of choice among all the big social networks in 2016. Remember that small can also be beautiful. You don't have to have a big expensive website in order to convey a professional appearance or to make it work for you in terms of capturing leads. It just needs to do the basic things well and the 10 (sorry 11!) things we've outlined in this article should get you off to a flying start. Want to discover how to get the most from your marketing in the quickest possible time? Complete our Marketing Grader Education Survey and we'll send you a series of 8 emails in priority order, giving you a tried and tested marketing strategy, and packed full of practical tips and tricks to show you how to do everything on a shoe-string budget. The survey takes on average less than 4 minutes to complete and has been described as an 'amazing resource, which I can't believe you provide for free'. Well we do! Take the following 20 question survey here and look no further for a marketing strategy that you can achieve in a few simple steps. Use a subscription to Co-Kinetic to publish our stunning, ready-made content, created for you, straight to your own social networks in no more than 5 clicks and watch it collect new email leads as you sleep. Find out more info here or watch the video below. For a summary slide of the key points in this article click here. Want other articles like this? Register using the form below and we'll keep you updated when we publish new Entrepreneur Therapist content. Check out the Related Content box under the Author Information panel below for other articles in this series. Google reviews and why they're so important. Which clinic would you be most likely to click on? Would you like to add your own branding to this piece of content? This will add your logo, company name and contact details to the footer of each page. You can set up or amend those details here. Did you know you can upgrade your subscription to include the ability to add your logo, company name and contact details to the footer of our patient information content?